The submerged riverbed of the McKenzie River in Trail Bridge Reservoir is a fun dive outside of Eugene, Oregon. 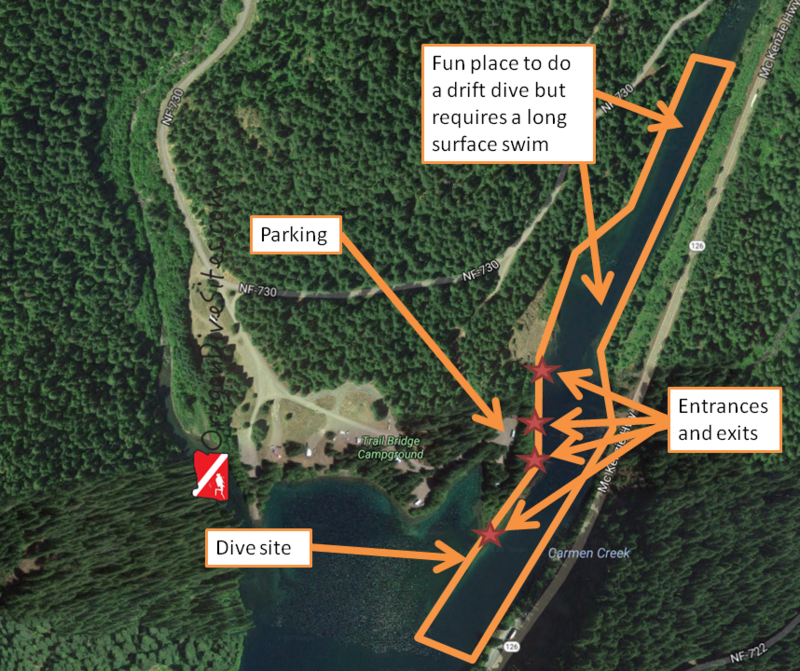 Depending on how much water is being discharged from the Smith Reservoir hydroelectric project through the powerhouse above this dive site, the site can be dived as a drift dive. In lower water flow times, it is easy to swim underwater up one riverbank and down the other. There are old stumps, logging cables, other logging detritus, and trout to be seen. Visibility is usually 20+ feet but sometimes is better depending on the time of year and how much water is flowing through the reservoir. 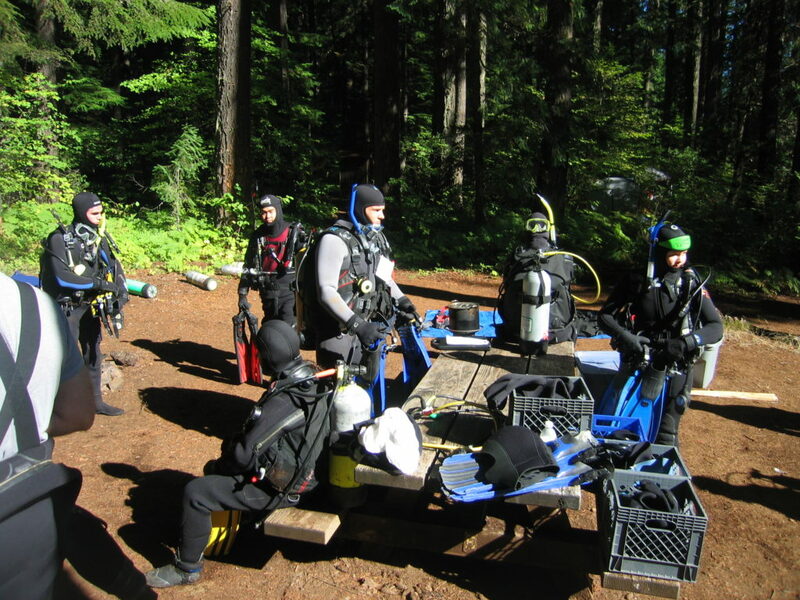 A group of SCUBA divers getting ready for training dives as part of an Altitude Diver specialty course at Trail Bridge Reservoir. 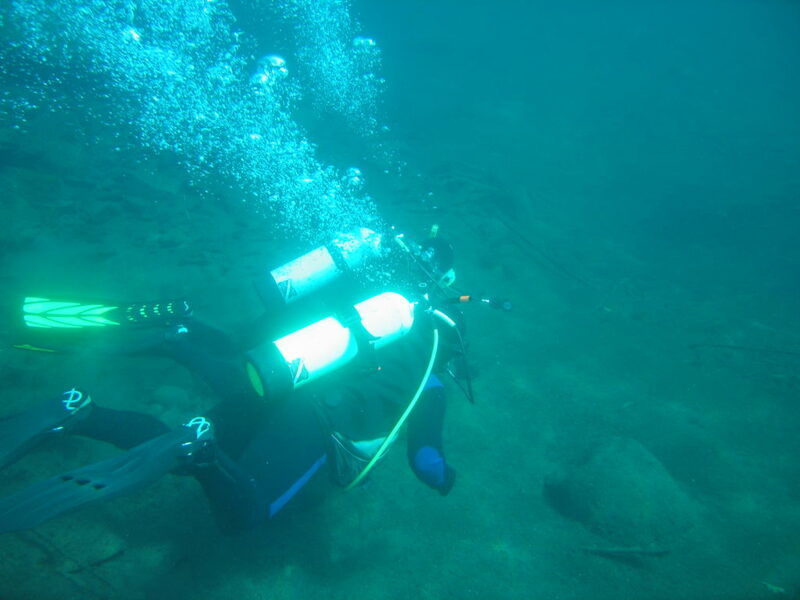 The main highlight of this SCUBA diving site is the submerged riverbed of the McKenzie River. On the east bank, Sweetwater Creek pours into the reservoir from a culvert in a small waterfall that is fun to swim under. In the riverbed, we have found old choker cables from logging operations, many beer cans, and golf balls. Sometimes you can spot the odd trout swimming by in the gentle current. If you’re up for the challenging surface swim, you can swim far up the old riverbed toward the hydroelectric turbines at the very head end of Trail Bridge Reservoir where water from Smith Reservoir comes down the penstocks. From there, you can do a leisurely drift dive back to your car. This Oregon dive site is in the middle of nowhere. Eugene and Springfield are the two closest big towns. The little berg of Rainbow is down the McKenzie River Highway and has a few services. Most people coming to Trail Bridge Reservoir will come up the McKenzie River Highway (State Highway 126) from Eugene, Oregon. The turn onto National Forest Road 730 can be tricky if there is a lot of traffic. Slow down in advance and put your turn signal on early. We usually park right next to the old riverbed of the McKenzie River. Sometimes people are camped here but the area is large enough that you can find a spot to park your car, assemble your dive gear, and get into the water. In the winter, the snow is deep enough that there is nowhere to park and this reservoir is effectively closed to diving. Check at the information kiosk to see if you need a day use or camping permit. The last time we went diving at Trail Bridge Reservoir, it was free, but this might change in the future. Trail Bridge Reservoir is a good place to camp for a few days while you dive the lakes up and down the McKenzie River. The dive site runs roughly north-northeast to south-southwest. At the top end, you will run out of water deep enough to dive in as you approach the hydroturbines. Don’t get too close to the turbines! You will hear the noise from the machinery as you start to get close to them. At the southern portion of the dive site, the river opens up into the main body of Trail Bridge Reservoir. We don’t usually go much further than the point of land that sticks out into the reservoir. There is not too much to see further out and the swim back can be tiring if there is very much current. There are several good entrances and exits right by the parking area. We usually walk up to the upper-most entrance to get in and come out at the lowest exit on the spit of land that sticks out into the main body of Trail Bridge Reservoir. Most of the entrances and exits have a large step or two on somewhat tricky ground to get down to the water. Depending on how much water is in the reservoir, there can be more steps that you have to deal with. The southern-most entrance/exit is very gentle and only about 100 feet away from the parking area. If you have trouble with big steps, this is the best entrance for you. We have seen some SCUBA divers get in further north along the old river channel but the entrances are very difficult with steep rocky descents down to the water. If you want to do one of the entrances further up the old riverbed, scout it out ahead of time to determine if it’s something that you want to tackle. Be courteous of other people who might be camped at or enjoying an afternoon at the lake. Don’t walk through where they are having fun without asking permission. Visibility is often 20 feet or better in Trail Bridge Reservoir. There are lots of little nooks and crannies along the submerged riverbed to explore. This is a shore dive. You could take a small inflatable zodiac up the channel to do the whole drift dive. There is an area to launch boats further to the west in the lake. There is normally a gentle current in the lower stretch of this dive site. In the upper end, the current can be a little more swift. Depending on what the Eugene Water and Electric Board is doing with its many dams along the river, the lake level can rapidly rise or fall. This can lead to big changes in the current. At the top end of the dive site, the hydroelectric turbines make a lot of noise underwater. Don’t get too close to the turbines. Below the bottom of the dive site, there are dam works that you should steer clear of. You don’t want to get sucked over, under, or through Trail Bridge Dam. Visibility is usually around 20 feet in the old river channel. Because of the current, any stirred up silt will quickly be pushed away. We have seen water temperatures ranging from 40F to 52F depending on the time of year and how much water is flowing through the reservoir. Early in the spring during the spring snow melt, water temperatures can be colder. Occasionally, we have encountered a thermocline in the top few feet of the water column near the Sweetwater Creek waterfall on the east side of the dive site. Very rarely, we’ve encountered some chilly water in the very bottom of the river bed. We prefer diving this site in the summer and fall. The site can be dived in the spring after the snow has melted from the parking area although the water is colder then. In the winter, the site is inaccessible because of the snow. If you take a shovel and start digging, you can hit 40 feet. Most of the site is in the 25-30 foot range. The farther upriver you go, the shallower it gets. Open water divers with several dives under their belts will find this site accessible to them. However, this is an altitude dive and you should have an altitude diver specialty course certification. The reservoir is at 2,000 feet above sea level. 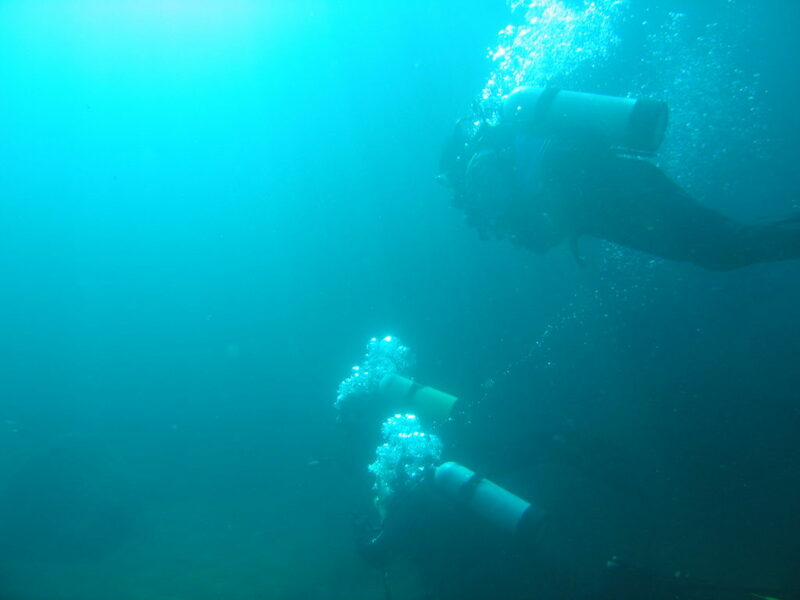 A drift diver specialty course is also useful if you are planning to do a drift dive. The diving is easy in the lower portion of the dive site. In the upper portion, the dive can get more strenuous because of the current. We rate this an intermediate skill level dive site because of the altitude. Depending on which entrance you use, the walk is between 20 and 300 feet. Some of the entrances have big steps on loose ground to get to the water while one of the entrances is a very mild walk into the water. You can start diving right from the entrances or you can do a surface swim upriver to do a drift dive. A surface swim of 1000 or more feet is possible here if you want to swim that far. The water level can change rapidly at this site due to what the Eugene Water and Electric Board is doing with the dams up and down the river. We have observed people hitting golf balls into the reservoir aiming for SCUBA diver bubbles although usually it is friends of the divers doing the golfing. This site is inaccessible in the winter. Be mindful of not going too close to Trail Bridge Dam or of the hydroturbines upstream. Remember that this is an altitude dive and you need to be trained on how to dive at altitude. A good dive light will help you to see into the little nooks and crannies along the submerged riverbed. We have several dive lights we recommend and use every time we dive in Oregon on our SCUBA Gear We Use page. You’re a long way from any dive shops. Eugene is the closest town with a shop for air fills or gear repairs. Up at Clear Lake there is limited food service at the resort lodge. Otherwise down toward the little town of Rainbow there are a few restaurants and convenience stores. There is plentiful camping at Trail Bridge Reservoir right at the dive site. Up at Smith Reservoir and at Clear Lake there are additional camping grounds. Clear Lake has resort cabins that can be rented. The National Forest generally allows primitive camping but check with the local ranger station for current restrictions due to logging or fire danger.